I think the less an email application does the better — feature-rich ones only encourage users to move in. I’d rather spend my time somewhere else. I might be the only person who ever thought to complain that the key shortcut for "Send this message" is different across mail clients - I guess most people only use one. I've always read this as 'deliver'. I also like the use of the shift-key, because sending isn't undo-able*, so it should be a little hard to hit accidentally. Not shown in the menu, I had to search the help for this. I guess the Postbox folks decided that ⌘⇧D is the Mac standard. I'd have to agree. ⌘↵ seems weird to me. Maybe this is why it seems weird. The help says there is a shortcut that works on Windows browsers, tab-enter. It's really just saying to use the keyboard navigation features to press the button, which also works for me on Safari. It's not really an obvious shortcut, but it works well enough. A nice detailed description of the updates to MobileMe's webmail client from Dave Caolo at his new blog, [52tiger](http://52tiger.net/). I haven't used MobileMe mail for several years, mostly because the couple hundred dollars I spent on .Mac without ever really getting much use out of it, before finally canceling it far too late, still kind of stings. How well does GMail let me create filters to handle heavy traffic lists? GMail is not perfect, but it's got the workflow down right. When I want to add a filter, I am probably looking at a message that I want the filter to match. So GMail's "Filter messages like this" command is a great match. They also know about lists, and they auto-populate the search command for the filter with the "list:list@foo.com" style search. This works out pretty great, and I've been using GMail for lists for years. It works to divert the flood out of my inbox, but it can also mean that for lists that aren't related to my job, I have basically unsubscribed to the list - out of sight, out of mind. I sometimes add filters to automatically "star" conversations I'm likely to want to look at, but that's not the best choice - it overloads the meaning of the star, and I'd rather see either tags that aren't full labels (and don't clutter up my label list) or a some other flag-like bit that is only set by filters to say when something might be interesting. How well does Thunderbird 3 let me create filters to handle heavy traffic lists? There's not much support for using a message to build a filter from, which I think is the most natural workflow. 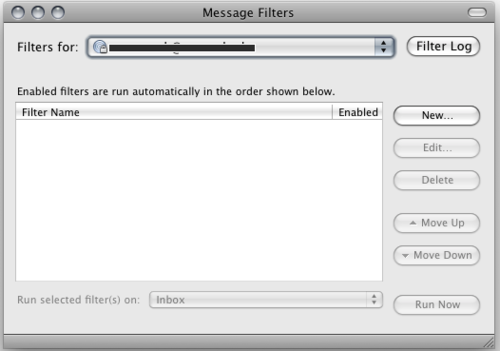 The menu item "Tools > Message Filters…" opens a dialog box that could use some simplification. For example, the buttons to move filters up and down in order are unnecessary - you should be able to just drag the filters around in the table. There are plenty of other non-mac-like UI elements here. Another example of overcomplicated UI is the "Filter Log" button. At best this is an "advanced" preference, but it's a big button at the top - and it's misnamed. It opens a sheet to let you turn the logging on, but who knows how you actually view the logging? There are some other UI problems when trying to add the filter - I didn't think ahead of time that I'd need to create the folder to send the filtered messages to. The Message Filters dialog seems modal, because the menubar goes away when it's in focus, but it's not really - so I just created the new folder back on the main window while the new-filter sheet was still open. A little strange, but it worked. It's also lacking a way to do a dry-run of the filter- to test which messages will match, before just letting it loose on your mailbox. This is a really important feature, especially when filters can do destructive or un-recoverable things like running a script (not in Thunderbird, but present in other mailers) or send a response. One thing that can make a big difference in a client is how well it helps you cope with heavy-traffic lists. Sometimes we need to stay on top of a firehose, and a client that helps filter out the noise and lets you keep track of what's going on in sometimes very long threads is an invaluable tool. You'll find plenty of opinions about how to do this, but I think it's well established that daily digests are not a great way to deal with traffic. It's great to only check things occasionally, but most list software doesn't let you say when it'll dump the huge pile into your inbox, and most mail software doesn't handle the multipart/digest format very well - usually it just gets combined into one big message. I think the best way is first to filter the list messages out of the inbox, and only check in on it every so often (more often if it's an important list for your job). You want to be able to quickly skim what's new since you last checked in - new threads, what changed in threads you've looked at already, etc. One way to do this is to have another filter to flag messages that are "interesting" in some way - either to me or mentioning me or my topics of interest, or from interesting people. I'm going to spread out comments on each client into a few posts over the next few days. I still like this idea, and I loved the example that Bryan Knight replied with - the OS 8 Color Picker crayons, seen in the third "Colour Selector" image on the OS 8 GUIdebook page. Apple's Mobile Me mail - a webmail that always struck me as trying too hard to be like a desktop mail client - has been re-designed, and it added two features that I completely agree with in a mail client - widescreen view (a message should be the entire height of a window) and a one-click archive button, to help achieve Inbox Zero as fast as possible. It's a little like Facebook's games and other apps, and I'd be surprised if that's not what they're competing with. However, it's another good idea from web apps that would work in desktop apps too - why not allow other applications to easily see and work with the data you've got in mail? This kind of app could either be a plug-in add-on to the mail client or a separate app that just accesses the mail data directly. Supporting both would be great. I'm writing a presentation with Beamer, a LaTeX class for making PDF slides. This doesn't work for my personal favorite PDF reader, Skim - but luckily there is a full explanation of how to make it work on the Skim Wiki: Tips and Tricks page. The short of it is you create three tex files - one with all the content and two wrappers that generate two versions of the same presentation. One version has slides and the other has notes. Then you can set up Skim to auto-scroll the notes PDF as you move through the slides PDF in presentation mode. Big thanks to whoever wrote that tip - and to Christiaan for making such a great app.